Intended for four level 8-9 adventurers. Bloodgate Keep is the classic castle to dungeon-delve: three floors of demonic forces for a party to slay, treasures to plunder and secrets to uncover. This makes the quest easy to integrate into any setting with demons or an underworld, In the Years of Gold setting, where the underworld is distant and demons are rare, the keep is a special occasion; in other settings, perhaps not so much, but nonetheless a fun run. Bloodgate Keep - an appropriate name. A fairly straightforward dungeon delve into an underground keep, with the foes being big, brutal and obvious. It's a free-for-all, and a good breather especially after a lot of intrigue-based quests. The mood can swing from violent fun to creepy horror at the DM's discretion. Bloodgate Keep is the armory and barracks of Skarrnog, the chieftain of the Great Claw and a serious player in the fate of western Pansaer. 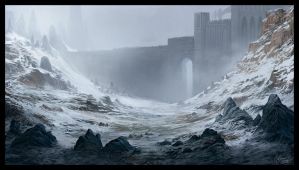 The keep is hidden in the lowlands of Hundon, and arms the armies of Skarrnog. Rakabarr and Urabarr, monstrous ogre brothers, are the undisputed tyrants of the fortress, and the wicked magics of Skarrnog's shamans have conjured an army of underworld denizens to their aid. If the west is to survive, Bloodgate must fall. The simplicity of the dungeon itself lends to a roleplay-intensive lead-up: the party should really have to work for the quest. This makes the sudden splurge of adventuring and combat all the more great. The area around the Keep is abandoned, rocky lowland, and the ogres are terrible at setting sentries. The party might run into a single group of four fiendish ogres (EL 8) on the way there, but other than that, the approach should be uneventful - the opposite of the actual assault. The party can enter either through the front gates (ending up in C1) or through the hidden coal chutes, if they've sniffed them out (ending up in B5 and having the element of surprise). (on approaching the keep) The stunted birches begin to thin out as you ascend the largest hill in the near area. Fierce winds whip the bald top of the hill, and when the wind flows down from the top, a nasty, unnerving smell enters your nostrils. You eventually come to the top, where a flat fortress built of black stone dominates the view. A trampled-down dirt path leads to the gate, with strange poles or columns on the sides. When you come nearer, the hideous truth becomes clear. These aren't poles. They're crosses, with flayed corpses crucified on them. (on approaching the coal chutes) Cart tracks lead to great iron chutes dug into the cold ground. This must be where coal is deposited deeper into the fortress. Peering into the darkness makes you nervous: just how deep does this go? NOTE: Whenever coordinates are present, alphabets are vertical and numbers are horizontal. The roar of rushing water sounds in your ears as you step into a tall, square hall. The smell of blood reeks forth from the large, ivory altar in the middle of the room. A massive, strangely blue-tinted ogre, floating ever so slightly above the flagstone floor, stares into a great pool in the back of the room, the black of the water throwing back his bellowing prayers. The candles do little to light the room, and a lot to add to a terrifying atmosphere. 30ft.-by-30ft. room with a pool, 20ft. high. A large ivory altar (C3-4, D3-4) with a sacrificial +2 dagger and a large stash of ivory jewelry, worth 1000 gp, in it. A fiendish ogre mage (damage reduction 5/magic, resistance to cold and fire 5, smite (+5 damage) 1/day, CR 9) named Schizuun stands by the pool, summoning a filthy, hairy goat-demon (treat as bulezauFCI) from the waters. Both attack intruders without fear. The goat demon appears on the first turn of combat and gets to act normally, while Schizuun spends his first turn finishing the summons. The two behemoths work cleverly together, the mage hanging back over the pool using flying and pelting foes with cone of cold and other spells. The goat demon tanks the fight, flying into a rage as soon as possible and using few spells except perhaps a well-placed shout. The mage might run, but the demon never does. Due to the nature of Pansaerian demons (and to make the fight a bit easier), the goat demon can't summon other demons. The long, dark stairway comes to a sudden halt at what appears to be the lowest point of the underground fort. The air is thick here, thick and dank, and unpleasant animals crawl in the dark corners. You thank the gods you can't catch a proper glimpse of them. A slow, rolling chant echoes into your ears from beyond the doorway ahead of you. 30ft.-by-40ft. room, 15ft. high. All doors unlocked (hardness 10, 60 hp). Stairway to the two upper floors, large charred braziers on two corners. Staircase is 260ft. deep at lowest point. The heat gets more and more intense with each step you take down the stairs. After some time you reach a sturdy, dark hall, lit only by what appears to be a system of grates on the floor with burning cinders just below. Periodically, great yellow-white flames leap up from the grates, stoked by some unknown power. The air is thick with smoke and the darkness plays tricks on your eyes: was that a person you saw lurking in the corner? 50ft.-by-60ft. room with 20ft.-by-20ft. alcove on the left and a 5ft.-by-20ft. alcove on the right, height 20ft. Walls covered with crude murals depicting demonic figures and acts of butchery, walls lined with smoking braziers. All doors unlocked (hardness 10, 60 hp). Staircase is 110ft. deep at drop-off point (B5-6). Lines of grates on the floor (check map); fire leaps up from 'small' grates on even turns and from 'large' grates on odd turns, dealing 2d6 fire damage to anyone standing there (Reflex DC 15 half). Two pairs of fiendish ogres patrol the hallway, and when fighting commences with one pair, the other arrives soon enough. The two ogres begin the fight by bellowing for backup, then engage the closest foes. Two of the ogres wield snatchpoles, with the other two using heavy crossbows and falchions. The two with snatchpoles try to quickly grapple the most dangerous foes, hoping the arriving backup will take care of the rest; the other two fire their crossbows if the snatchpoles hit, and wade into melee with their falchions if they don't. They fight bluntly but effectively, and if they succeed on a grapple, they attempt to pull their foes to the grates. 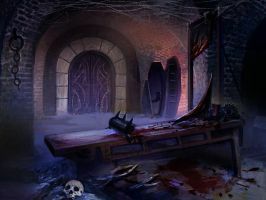 This room, although crude in a style similar to the rest of the dungeon, is rather more grandiose and decorated: the skulls of various animals (some of which you don't even recognize) adorn the walls, and the two massive beds are littered with fine furs. At the end of the room, a chest longer than a man fills a small alcove, teasing you with its fine design. You can only guess what treasures lie inside. 10ft.-by-30ft. room with 5ft.-by-10ft. alcove, 15ft. high. Two beds (A1-B2, E1-F2) with an assortment of bear and wolf hide rugs, as well as gold and silver goblets, tablewear and jewellery (altogether worth 550 gp). A massive locked chest made of cast iron in the alcove (hardness 10, 30 hp; Open Lock DC 21 to open, Strength DC 25 to burst); opens with Rakabarr's master key. The chest contains rubies of various sizes and cuts (worth 1100 gp), a pair of boots of elvenkind (too small for the ogres), three everlasting torches and a series of letters written in Goblin (from Skarrnog, concerning the equipment output and amassing a stockpile of weaponry for his growing army). The hairs on your neck stand on edge as you step into this room. The atmosphere is foul, somehow, and it's not just the acrid smell or the gloomy dark – something evil takes place in this room. Dozens of barbed chains hang from the ceiling, and the walls are lined with small cages, barely large enough for a dunner to stand straight. To your horror, you spot flayed, mutilated corpses in almost each one. Suddenly, one of the 'corpses' twitches and lets out a long moan. How can he be alive after he's been tortured like that? Two 20ft.-by-15ft. rooms with a 10ft.-by-10ft. corridor between, 15ft. high. Fourteen small cages on the walls: eight with flayed, humanoid corpses, one with human barely clinging to life. Torture has broken the man's mind, and he can do little but babble and moan until he expires. One of the bodies (cage at western B1) is wearing a +1 studded leather and a kukri, while another (cage at eastern C3) has a scroll of haste and a scroll of fireball. The taskmaster of the meathouse, a chain devil, hangs from the roof (Spot DC 20 to notice) and assaults unaware foes with the help of the four quasits that masquerade as gargoyle statues (Spot DC 15 to notice). The chain devil and its quasit underlings fight extremely cleverly, with the kyton animating the hanging chains of the ceiling to attack foes from all fronts and taking the blunt of the attack. Meanwhile, the quasits use cause fear to break up opposition, and execute fly-by attacks to poison enemies. They can also use invisibility, both to escape combat and to fight more effectively. Clever foes will leave the dangerous prison area to avoid the hanging chains. The heat of the dungeon is at its most intense here: flames spout forth from the three massive, blackened forges on the northern wall, threatening to scorch those that wander too close. A system of grates similar to the one in the main hall can be found here, exactly as unsafe as their brothers. Two anvils, almost as tall as a man, are propped up close to the forges. The unfinished blade of a massive greatsword lies on one, still blazing-hot from its time in the forge-flames. 60ft.-by-20ft. room, 15ft. high. Three massive forge mouths on the northern wall (against A2-3, A6-7, A10-11), two anvils (A4-5, A8-9), a section of an underground river (D6-7) where forged objects are cooled; a low archway leads from the river to room B6. All doors unlocked (hardness 10, 60 hp). The unfinished greatsword on the eastern anvil is a +1 flaming greatsword, but it has to be cooled in the river before it's usable. Lines of grates on the floor (check map); fire leaps up from 'small' grates on even turns and from 'large' grates on odd turns, dealing 2d6 fire damage to anyone standing there (Reflex DC 15 half). Rakabarr and Urabarr can often be met here, and are not the type to give people time to explain themselves. They fight as normal, with Urabarr separating a stronger foe from combat and dragging him to the grates to burn, and Rakabarr fighting opposition with his maul, using reach to fight from behind the grates. The light cast from the open door can barely penetrate the darkness here; you first blame some magical trick or other, but soon figure out it's just the swirling clouds of coal dust that are hampering your vision. Asides from piles upon piles of coal, this room contains nothing. 15ft.-by-30ft. room, 15ft. high. Piled coal (all but C3 and D3), chutes to the surface where coal is deposited from. Steam lazily rises from the open water before you as it vainly tries to dissipate the heat of the dungeons. A short rope bridge leads to a large platform where piles of weapons, armor, tools and other forged goods lie: you're best guess is they're waiting to be taken to the stockpiles upstairs. A low archway on the northern wall is where the water flows from, but thick clouds of black smoke also emerge from there. 50ft.-by-20ft. room, 20ft. high. A rope bridge (B8-C9), a large pool of water on the southern wall, formed by an underground river flowing in from archway (against A8-9). Piles of roughly-constructed weapons and armors at western wall (all sorts of equipment in Small, Medium and Large sizes); amongst them bracers of armor +1 (Search DC 30 to locate) and a +1 keen longspear (Search DC 40 to locate). The interior of the large, castle-like structure seems to reflect the grim environ outside of it: the dark cliffs mirrored in the soot-blackened walls, the dying trees in the rotten chandeliers, the blazing sun in the crackling braziers. In the middle of the room there's a gargantuan staircase, the center of which is dominated by a chain as wide as a wagon that runs into the unknown depths below. All features in the hall are larger than any you've seen – it's clearly meant for folk larger than men. And sure enough, just across the hall you spot three ogres, except their features are twisted and demonic. They growl and speak a few hushed words, then raise their massive crossbows with a jerk. 30ft.-by-60ft. room, 20ft. high. Gargantuan staircase (D1-I6, entrance at I1-2), leading into the two lower floors of the keep; the staircase is 260ft. deep in all, with each square descending 5ft. Platforms at D5-6 and I5-6 help access to C6 and C7. Three fiendish ogres with heavy crossbows (and falchions) patrol the far side of the room and assault intruders mercilessly, while a fourth one hides in room C2, ready to attack those who attempt to get to the ogres. The three fiendish ogres stand their ground and pelt all foes with their heavy crossbows (clever tactics by ogres standards), changing to falchions only if opponents get close. If and when the characters approach the ogres, their comrade bursts from the corridor, wielding a warhammer and a heavy shield - if the characters try to approach through the corridor, the warhammer ogre ambushes them. The ogres fight to the bitter end, always believing in their ability to win. The long corridor is lined with tall doors, built of brass and rotten wood. You can spot scratches and dings on the stone floor, even through the accumulated grime and filth; looks like something heavy has been moved around here. The asceticism of the style is unnerving: there are not decorations, no murals on the walls or carpets on the floor. Nothing. 10ft.-by-60ft. corridor, 15ft. high. Doors to storage rooms locked (hardness 10, 60 hp; Open Lock DC 18 to open, Strength DC 21 to burst), others unlocked. This storage room would probably be cramped for an ogre, but for you it's quite spacious. The air is dusty and thick, but the dust has been disturbed not long ago. Looks like this storage is used to stockpile goods (C3)/weapons (C4)/armor (C5). 10ft.-by-20ft. room, 10ft. high. C3: massive barrel of oil (A1), tall cupboard (D1-2) containing (in sizes varying from Small to Large) backpacks, bedrolls, hooded lanterns, rolls of hempen rope, tents, a set of masterwork drums, flagons of ale, foodstuff (some spoiled), two pots of oil of magic weapon, three potions of cure moderate wounds and a vial of barkskin +2; further, a wand of magic missile (3rd) has rolled out of sight in a crevice (Search DC 25 to locate). C4: two racks of weapons (A1-2, D1-2) with an assortment of weapons, mostly spears, swords and axes, in sized from Small to Large. C5: four rough wooden frames (A1-2, D1-2) with eight sets of armor hanging from them: two Medium chainmails, a Large chainmail, two Medium banded mails, a Small half-plate, a Medium full plate and a Medium breastplate. The smell hits you as soon as you open the door and makes you reel – god, it stinks! The smell comes from four massive beds, which apparently serve as the ogre's sleeping quarters. The stink comes from unwashed linen, rotting food (the identity of which you do not want to know) and all sorts of bodily fluids strewn about. Asides from the beds there are no other furniture in the room. 20ft.-by-30ft. room, 15ft. high. Four large beds (A1-B4, E1-F4). C6: one of the bed's pillows (E3) hides a large manticore-skin pouch (worth 200 gp) filled with silver coins (worth 225 gp) (Search DC 20 to locate). C7: an ogre has hidden his savings in a large pair of old gloves under his bed (worth 400 gp) (Search DC 20 to locate).